Hair straightening tools come in a variety of styles models, and materials. By looking at a few key features you can quickly and easily choose the best straightener for your hair type and style. No matter what degree of straightening you need or what condition your hair is in you will want a straightening tool with some basic features- multiple heat settings, automatic shutoff switch, automatic heat control, a ready light indicator, and a heat resistant handle. Multiple heat setting choices will allow you to set the straightener temperature specifically for your hair. For example, finer hair will need a lower temperature setting to achieve straightness, but coarse, thick, or extra curly hair will need more heat to coax out the wave. By choosing the lowest possible effective temperature you can reduce the amount of damage the straigthener does to your hair each time you use it. The automatic shutoff feature will help eliminate accidental burns and electrical problems if you leave and forget to turn the straightener off. The automatic heat control sensor will help regulate the straightener's temperature for even heat distribution and control. Finally, the ready light indicator and heat-resistant handle will help you avoid burning your hands and fingers while using the hair straightener. The light will let you know when the tool has reached the proper temperature so you won't have to touch the heated surface with your finer, and the handle will help you control the straigntener without burning your scalp or fingers. Once you find a few straighteners with the basic features you need to narrow down the selection by focusing on the features that are targeted to your hair type. Ceramic plated straighteners are great for dry, colour-treated, damaged, or very curly hair. The ceramic plates will help distribute heat evenly for more effective curl elimination and will lock moisture into the hair strands during the straightening process. Plus, the smooth surface is less damaging to brittle or overstressed locks. Straighteners with negative ionic technology are great for brittle, frizzy, or chemically processed hair. The negative ions add moisture to hair strands, reduce hair's exposure to direct heat, and enhance the hair's natural shine and smoothness. Straighteners with brush attachments or rubber de-tangling spikes are great for tight curls or rough, damaged hair strands. The flexible nodes help smooth out hair for the straightening process without putting unwanted pressure on the hair strand or root. Wet-to-dry straighteners are designed to smooth out hard to relax hair. The temperature choices and special plating allow individuals to process wet or damp hair without increasing hair damage. This type of straightener also helps control frizz, boost shine, and lock in moisture. Finally, straighteners that feature a blow dry combination can be great choices for individuals with damaged hair, or those you want to tame hair but not necessarily remove all of the body or wave. 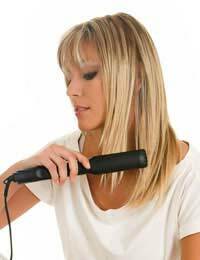 Blow dry straighteners use the heat from the blow dryer to reduce curl thus reducing the amount of direct heat contact between the straightener and the hair. New technology is being discovered every day and new advancements and improvements are being to made hair straighteners. By shopping around and comparing products you can find the perfect straighthener for your hair and style type.